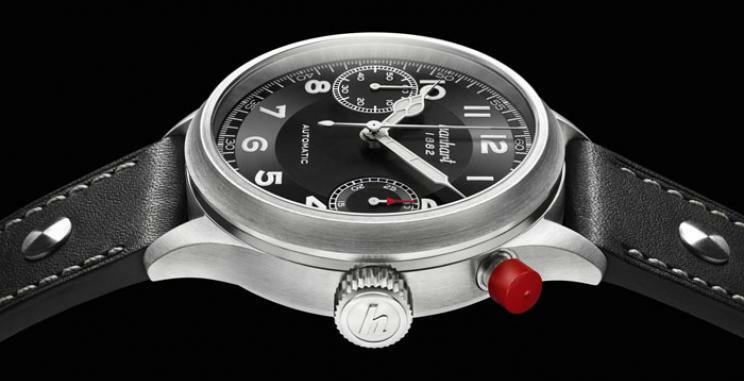 If you like your watches ultra noticeable, then the new Hanhart Pioneer MonoScope is for you. Designed for pilots who can't afford to take their eyes of the distance for a moment, and who need a large at-a-glance watch face, the Pioneer MonoScope's unmissable 45mm casing, like its legendary predecessors, features a single button for controlling the entire range of chronograph functions. This new model from the Pioneer collection also bears another hallmark of the early precision timepieces made by the Swiss-German watch brand in the widely spaced arrangement of its small seconds and 30-minute counter displays. 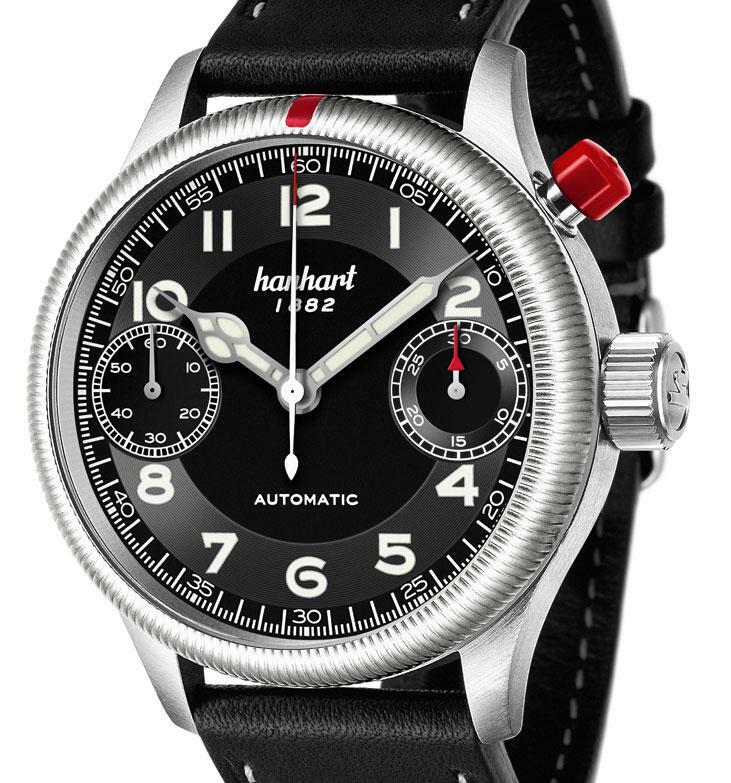 In the first half of the 20th century, Hanhart was a pioneer in developing highly functional precision chronographs. As early as 1938, the Swiss German watch brand designed a monopusher model for naval officers, featuring its own “Calibre 40” movement. All of the chronograph functions on this wristwatch – start, stop and reset – are performed by the same button and always follow strictly one after the other. Unlike its two button equivalent, the seconds hand on this chronograph cannot be restarted after it is stopped. The next time the button is pressed, the seconds hand invariably jumps back to its initial position. This is perfect for navigating safely and measuring distances at sea as it rules out any possibility of faulty navigation by dispensing with an addition stopping function. The technical design with a single button is also the trademark feature of the Pioneer MonoScope. The automatic movement enclosed in the generously sized stainless steel case has had to be re-engineered slightly to suit this monopusher arrangement. A large shift lever is responsible for the third strike on the chronograph cam. This cam has also been modified so that it has an additional tooth on its lowest level, enabling the shift lever to control not two, but three positions. A further modification of the calibre has made it possible for the two displays for the small seconds and the 30 minute counter, which are typical of Hanhart chronographs, to be positioned right on the edge of the dial. The movement has a power reserve of around 42 hours. The model is reminiscent of its predecessors from the 1930s. On the Pioneer MonoScope, the centres of the two displays, together with the numerals 2 and 4 as well as 8 and 10, form a straight, vertical axis, resulting in a symmetrically balanced presentation. The large, easy to read face also features distinctive luminous Arabic numerals and the hands which are also coated with Super-LumiNova®. 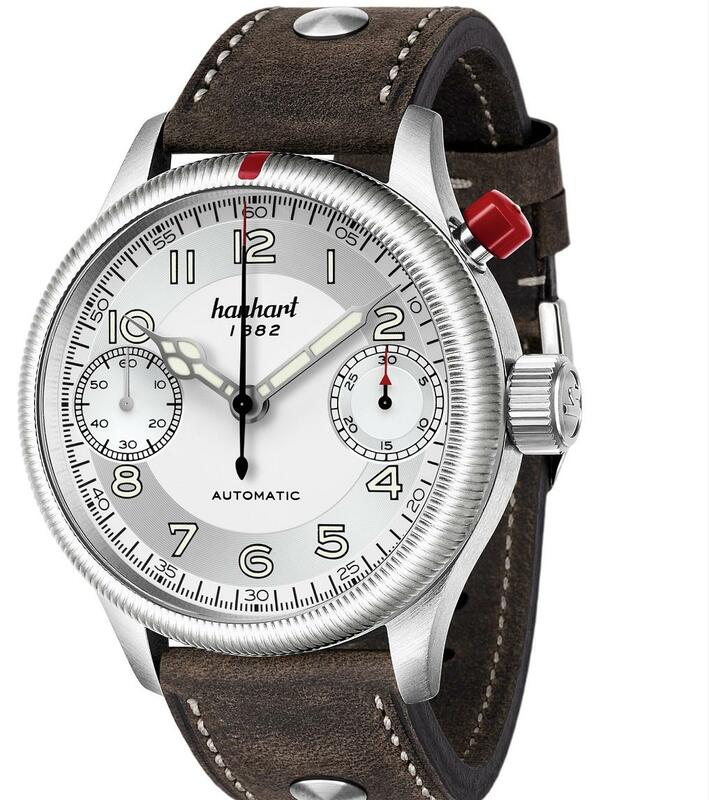 The minute hand is bent downwards slightly to ensure a more precise time display. The black and silver colours used on the watch reflect the colours traditionally preferred for precision timepieces. To guarantee maximum water resistance and robustness, the Pioneer MonoScope is, like the models on which it is based, fitted with a sealed, screwed down case back which includes three indentations for the case key. The rivetted strap made from hardwearing calfskin and a high quality pin buckle fit the wrist securely. The Pioneer MonoScope is also optionally available with a stainless steel bracelet and an adjustable folding clasp. Calfskin with riveting and stainless steel pin buckle or stainless steel with adjustable folding clasp.